Our last cruise came literally a couple of days after I got back from the Dutch Cube Day, and as you’d expect, I came back laden with unsolved puzzles ... so along with the usual pile of books (neatly loaded onto my Kindle!) I snuck in a couple of puzzles as well... small puzzles, flat puzzles, puzzles that wouldn’t break in the hold luggage – I took a few tray packing puzzles and my copy of Wil’s Magic Domino puzzle. Now I had several reasons for taking a few packing puzzles – firstly there’s all that stuff above about them being flat, quite sturdy, easy to pack and the like – but I remember reading in Brian P’s blog about his visit to Stewart Coffin that the master himself always goes cruising with a particular tray puzzle (Coffin #167 if you’re interested) that has subsequently been dubbed “Cruiser”. If someone like that, with access to heaven only knows what variety of puzzles chooses to take tray puzzles on a cruise, then there must be something in it! And then there’s another reason why I chose to take a few packing puzzles: I’m RUBBISH at them – so by taking a couple I would ensure that I had several happy(!) hours of puzzling ahead of me (and no doubt several unhappy ones as well! See previous point!). 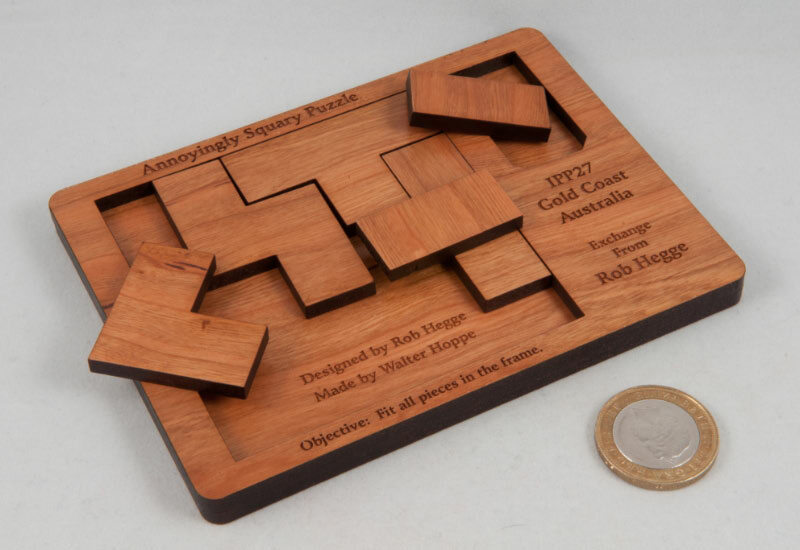 First up were a pair of IPP exchange puzzles from Rob Hegge (who doesn’t write a blog!). 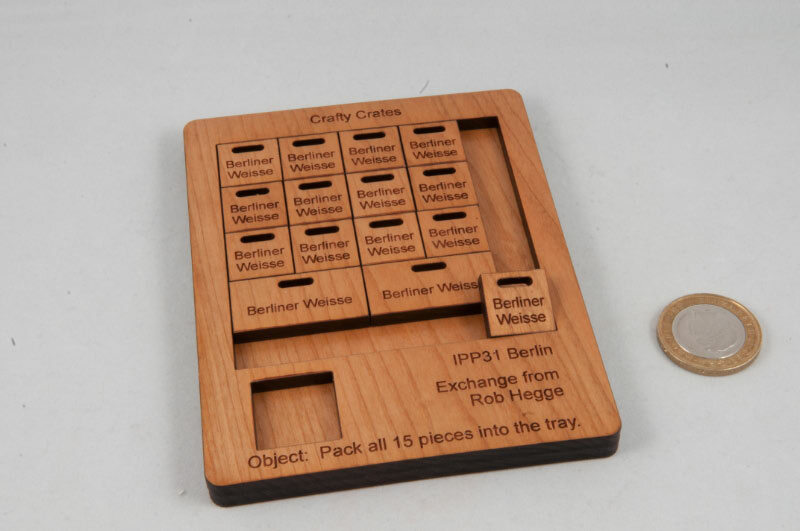 Crafty Crates was his exchange puzzle in Berlin this year and Annoyingly Squary Puzzle was his exchange puzzle from IPP 27 in Australia. When I bought them from him he made sure to warn me that the Crafty Crates had a solution that was quite irregular – he didn’t say anything about the other one, but I suspected that it would require a piece or two at a squiffy angle as well and that he was just trying to lull me into a false sense of security. Each puzzle has a main tray area and a hole on the side for storing the ‘extra’ piece – and thoughtfully the main tray area includes the scrap piece to keep all the bits from flying around. Both tray areas are square (sometimes it’s worth checking!) and pretty much what you see is what you get – they’re pretty honest puzzles! Crafty Crates was up first – it has lots more pieces, so it should be easier, right? (Because by my reasoning, there are fewer constraints...) Effectively you have 13 unit sized beer crates and 2 double unit sized beer crates to fit into a square tray a bit over 4 units square – plenty space ... just not where you’re going to want it! It doesn’t take very long to convince yourself that any square packing won’t work – the edges aren’t long enough – so something will be at an angle ... and that opens up a whole world of pain and experimentation as you trudge through all the things that don’t work. After a while I figure that there will need to be a pretty efficient combination of some stuff that’s square-ish and some stuff that isn’t – and it takes a bit more experimentation to narrow down a line of enquiry before stumbling onto a construction that works ... so I took a picture of my solution, packed it back up again and left it on the coffee table for the next victim to wander in and have a bash. All up, it probably took me about an hour – in 10-15 minute chunks over the course of a day or so... damn fine value per puzzling Euro! Annoyingly Squary Puzzle turned into significantly better value for money than that, and in case you’re wondering, they cost about the same! ASP has seven pieces to be placed in the tray, including a single unit square – that should help, right? This one kept me going on and off for days! Having solved the Crates, I thought I had a strategy that would help. My strategy combined some things in corners for “efficiency”, and then some bits at weird angles to fit in between them - of course all that “strategy” taught me was that the eventual answer is nothing like what your brain keeps telling you is the most efficient way of doing things – and that’s probably the central design tenet behind all of these sorts of packing puzzles: if it looks ‘efficient’, it will not work! I must have taken several hours spread over a couple of days before I finally managed to settle on just the right combination of square and not-so-square aligned pieces to get them all jammed into that damn square tray. This puzzle is very well named, Rob. 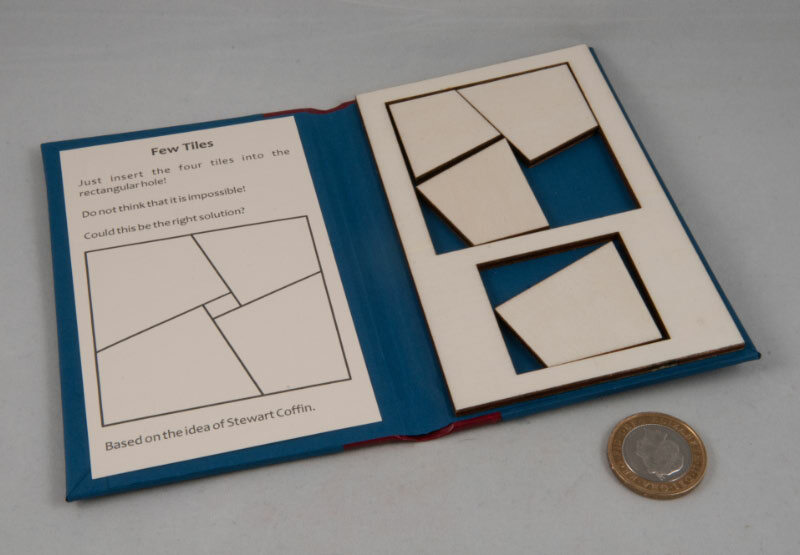 The last packing puzzle I want to chat about here is a delightful version of Stewart Coffin’s Few Tiles that I acquired from Bernhard Schweitzer. 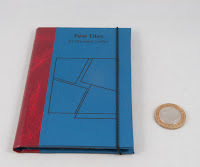 It’s made by a Hungarian gentleman named Peter Gal – who's hobby is bookmaking (and not the bet-taking variety! so perhaps bookbinding would be more appropriate, but that would kill any betting jokes, so he's a bookmaker!) – not typically the sort of craftsman you might associate with puzzle-making – but take a look at this little book – because it really does look exactly like a book! From the outside it looks like a tiny notebook, complete with elastic strap to keep it closed ... open it up and you’re presented with a set of printed instructions (complete with a highly misleading picture!) 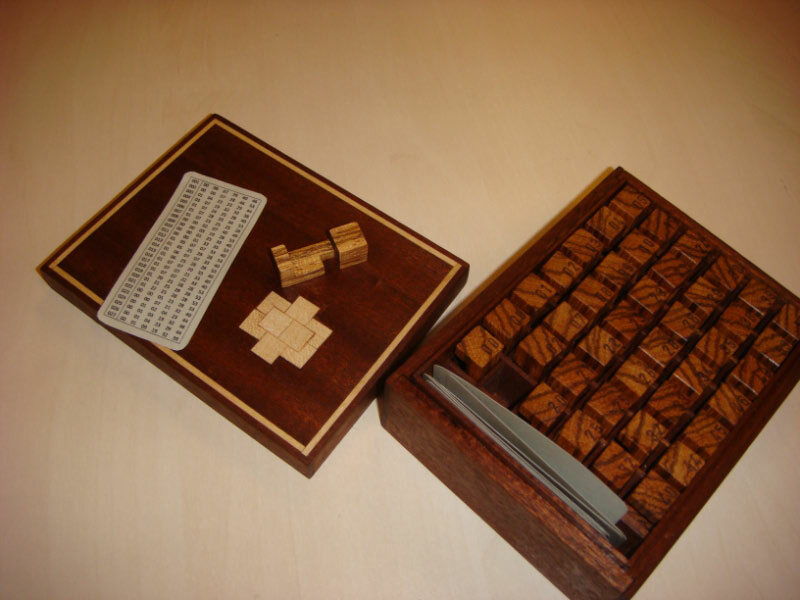 on the left and a laser-cut tray and pieces on the right. Being perfectly laser-cut, the puzzle is absolutely true to Coffin’s design and provides a great challenge – and as these designs from Stewart Coffin go, this one’s a killer! He uses all of your assumptions and even your ‘knowledge’ of his other designs against you – sneaky sod! For me, the presentation of this puzzle is simply terrific – I hope Peter continues to make many more of these variants – I’m sure I’ll be wanting to add to my collection of little notebook puzzles. 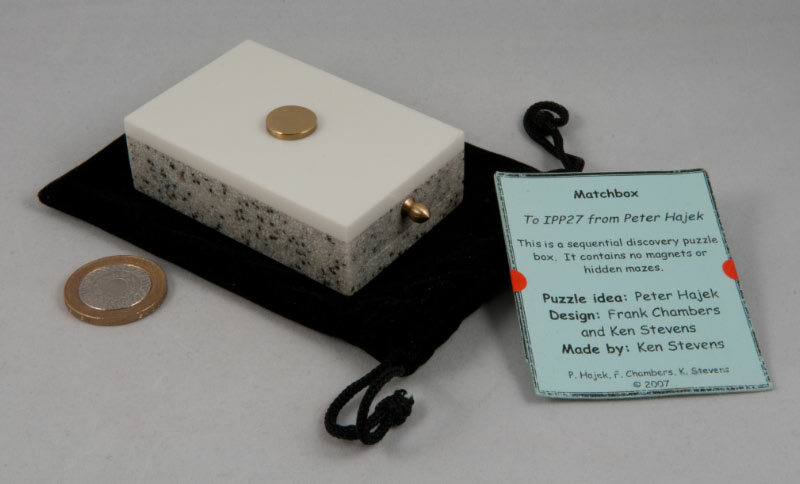 Matchbox was Peter Hajek’s IPP exchange puzzle in 2007. Peter took care of the design himself (with some technical advice from Frank Chambers on the internals) and then Ken Stevens manufactured them expertly in Corian. It’s a sturdy little puzzle that could probably do some damage if you ever hurled it at an intruder. It’s a little bigger than an ordinary matchbox and appears to have a drawer that refuses to slide out. There’s a little brass knob attached to the alleged drawer, and a flat brass button thingy on the top of the box. 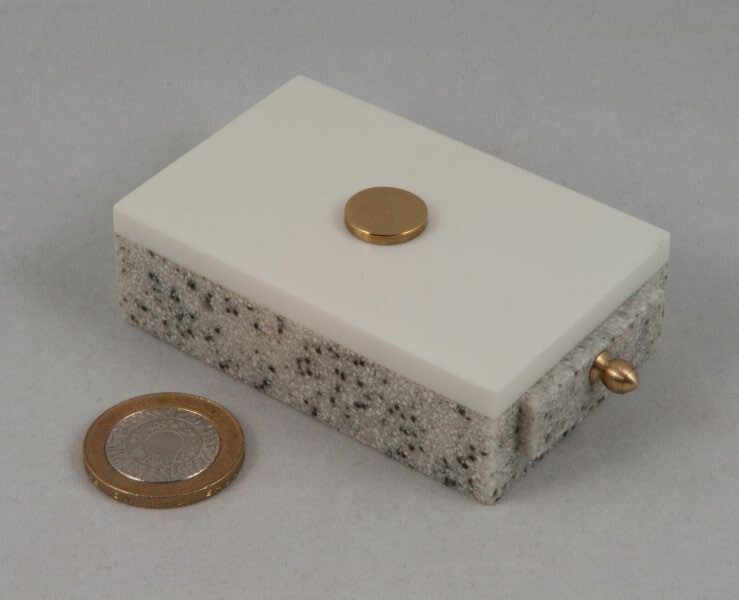 There are a couple of holes on the sides of the box that you might not notice at first because of the camouflage effect of the speckled Corian on the sides. Nothing else interesting strikes you about this little box made of rock … other than some gentle rattling inside – matches, perhaps? Open the box and then reset it for the next victim. When Louis and I went around to Wil Strijbos’ place, Wil had placed his copy on the coffee table for us to have a bash at. Louis had a crack at it and made some pretty good progress fairly swiftly, releasing a tool (it’s a matchbox, I’m sure you can work out what the tool was!) – he then spent a while experimenting with what the tool might be capable of and found some interesting things to do with it, but none of them seemed ‘enough’ – it was almost as though he needed another tool – but finding the second one turned out to be a lot harder … although once you find the second tool, opening the box and then resetting it, is an absolute doddle! The Matchbox is an excellent puzzle that uses a couple of preconceptions about what you can do and what you can’t do to tie you in absolute knots – and it will put a fat grin on your face when you crack it! After Louis had opened it, Wil mentioned that he had a spare Matchbox if I was interested – it’s on my desk as I write this! Thanks Wil. 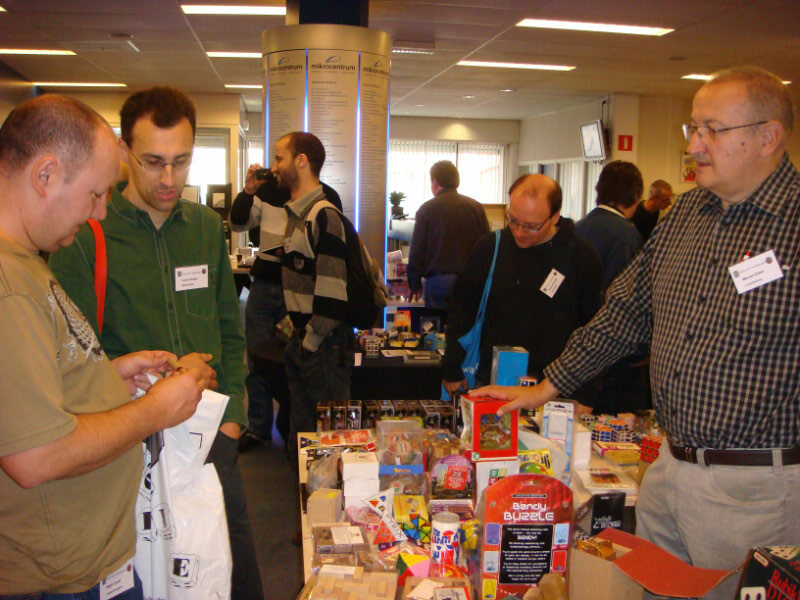 I picked up a copy of Wil Strijbos’ latest IPP exchange puzzle, Magic Domino, from his stand at the Dutch Cube Day. It’s a colourful looking laser-cut puzzle although the aim of the puzzle isn’t immediately obvious, until you read the laminated sheet that comes with it – then it all makes sense: Wil’s taken a simple sliding tile puzzle and combined it with a vanishing leprechaun / Sam Lloyd’s Get off the Earth illusion! Hang on, hang on – slow down there just a minute kiddo ... he’s done what?! 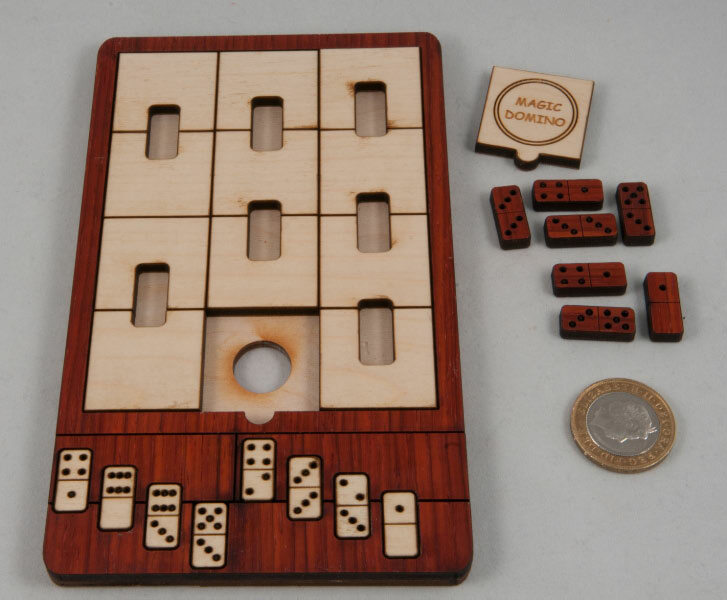 Right, now down the bottom there are eight white dominoes in some spare slots – he thinks of everything does our Wil! 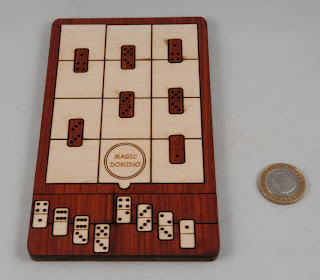 Remove the two sets of dominoes from their current resting places – notice there’s one more white domino than brown – worry a little. 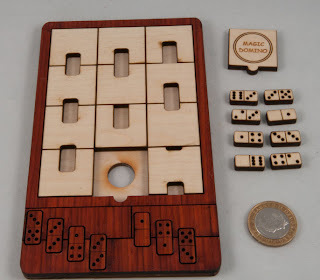 The holders for the spare dominoes down the bottom have a pair of removable tray parts – take them out and swap them around – did you notice the magic happen just there? There are now only seven slots down the bottom instead of eight – TA-DAA! Place the brown dominoes in those spaces – noticing that they only just fit in – which is all a bit spooky. OK, all of that is really just a little bit of showmanship to prepare you for the main puzzle: now you need to manipulate the sliding tile puzzle to create EIGHT holes for the white dominoes to fit into in such a way that the Magic Domino piece can be replaced (and you’ll notice that because of its little tab on the bottom, it has to go in the middle of the bottom row). Right, so not only are you being asked to bend the laws of time and space just a little, you also don’t know what the final position of the domino pieces is going to be – and hence you’re working blind. 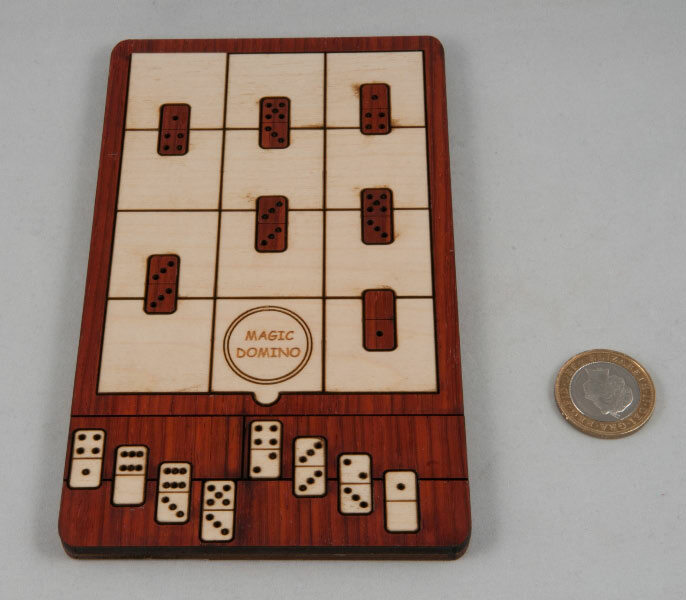 You’ll probably have noticed that the dominoes aren’t exactly the same size, which gives you a bit of a steer on how you’re going to create that extra space since you can probably guess that the fit for each domino is going to be pretty snug. You’ll need to make a couple of assumptions and then start experimenting, testing the holes you’ve made as you go along. Mercifully the field of play is a bit smaller than a traditional 15 sliding tile puzzle and that cuts down on the possibilities quite a bit. 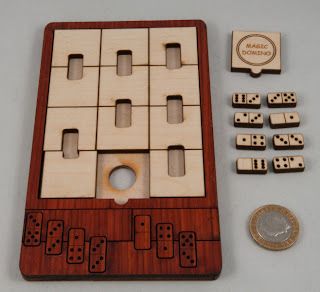 Once you have the right combinations in the right places, you can pop the Magic Domino tile back into its spot and slot the eight white dominoes into their holes in the top half. Time and space duly bent, just a little. I found this a really cute implementation of a couple of puzzling ideas that I’d never imagine putting together in the first place. Great idea Wil, and well done for coming up with something totally new! One part magic, one part puzzle - all in all, great fun. 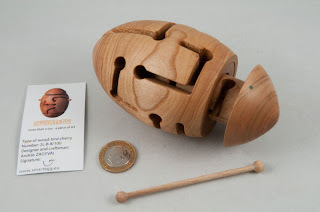 I first heard about SMARTEGGs back in February when Bernhard Schweitzer posted a link and a couple of pictures of some incredible new puzzles he’d found at this year’s Nuremberg Toy Fair. The egg-shaped 3D mazes had been designed and handmade by Hungarian architect Andras Zagyvai and I think it’s fair to say that they really stood out from the crowd. 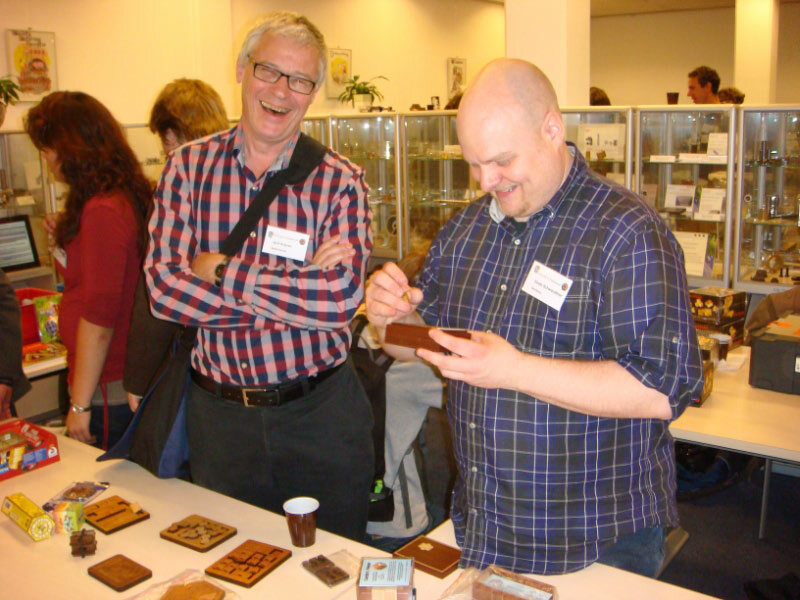 Bernhard invited Andras along to his customary puzzle get-together at the Toy Fair and Andras showed off his puzzles to an appreciative audience of puzzle-cognoscenti. A little while later I trawled through Andras’ website but couldn’t find any indication of price or availability – unless you wanted to enquire about buying the rights to SMARTEGGs – and I wasn’t quite ready for that yet. Fast forward a couple more months and fellow MPP-er Oli – the Puzzle-Obsessed one – had managed to fit in a visit to Andras on a trip to Hungary – took lots of pictures and wrote about his visit over here. Andras and Nora sound like a wonderful pair and I really loved the idea of the 3D maze encased in a beautiful piece of woodwork. A short while later I asked Oli what the pricing looked like on the puzzles and was a bit shocked at quite how high the prices were – however, at that stage Andras was designing each puzzle individually and then making a single copy – a process that took him around 6 weeks – and with that perspective, I guess the prices seemed less unreasonable, but still awful dear (or like an antler, off a deer, if you’re from Glasgow!). At that point I guess I gave up on owning one of these puzzles ... until Bernhard posted a rather enticing note on a puzzle forum saying that he’d convinced Andras to make a limited edition run of puzzles at a much reduced price – and that he’d have a couple available at the Dutch Cube Day, was anyone interested? You can probably fill in the blanks yourself (or you can read how I met Bernhard at the DCD in my blog post!) and there is now a rather handsome SMARTEGG number 2L – B – 8/100 sitting on my desk. For the record, Andras has chosen three designs (A, B & C!) to make a run of 100 copies each – so the serial number pegs this one as a 2 Layer puzzle, design B, number 8 of a series of 100. The puzzle comes in a neat little bag made by Nora, complete with SMARTEGG logo embroidered around the bottom. In the bag there’s a certificate signed by Andras with some basic instructions on the back, a stand, a stick and a SMARTEGG. The egg and the stand are made from cherry wood from Andras’ own supply so that he can use wood from the centre of the tree in order to get the fantastic effects of the grain around the egg. The stick that you have to navigate through the maze isn’t quite what it appears to be at first – it looks like a stick with a couple of balls stuck on the tips – but if you look a bit closer you’ll see that the balls on the ends aren’t stuck on and the whole thing is turned from a single piece of wood ... it’s all in the details, and Andras is clearly proud of his work! Right, back to the egg – there’s an inner piece with some holes and slots that will line up with holes and slots on the outside. The inner bit can rotate 360 degrees and slide in and out of the outer piece by about an inch. There are a pair of dots on each of these pieces (one green, one red) and two of the larger holes on the outer shell of the egg itself are painted red and green respectively. The aim of the puzzle is to line up the two green dots, insert one end of the stick through the green hole and then manipulate stick and egg to navigate the stick through to exit at the red hole with the two red dots lined up. 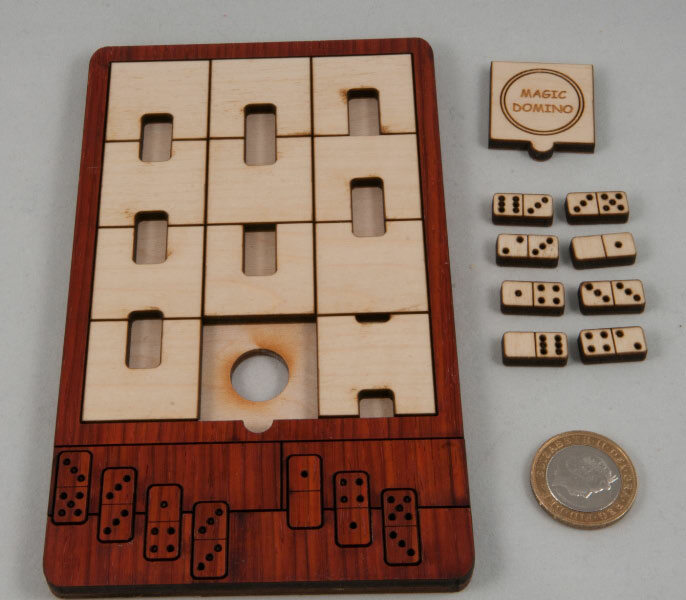 OK, so you take the plunge and pop the stick into the green hole and find it goes in about halfway – you can see a slot to the left so swing the stick along the slot, effectively trapping the stick in the puzzle. Then notice that you can rotate the inner piece and soon enough you’re able to push the stick in further so that it pops out the other side – and now the inner piece can be pulled out, and rotated a bit ... welcome to SMARTEGG! 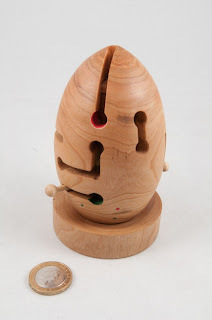 You’ll find a series of different sorts of moves that will enable you to switch between sides of the egg, and indeed between tracks on the inside piece – you will need to wander backwards and forwards a bit in your aim of getting out of the red hole, and in fact you might notice that some of the moves you can make are a little less than orthogonal! This particular model isn’t a staggering puzzling challenge by any means – but in fairness, remember this isn’t the hardest one available! I reckon it shouldn’t take a puzzler too long to wander through the maze the first time, and a little analysis and thought will show you how to take the most direct route possible. It’s fun to play with – prodding and twisting while holding it at odd angles to see what’s happening to the inside track and planning a strategy for moving ‘forward’ – whatever that is! 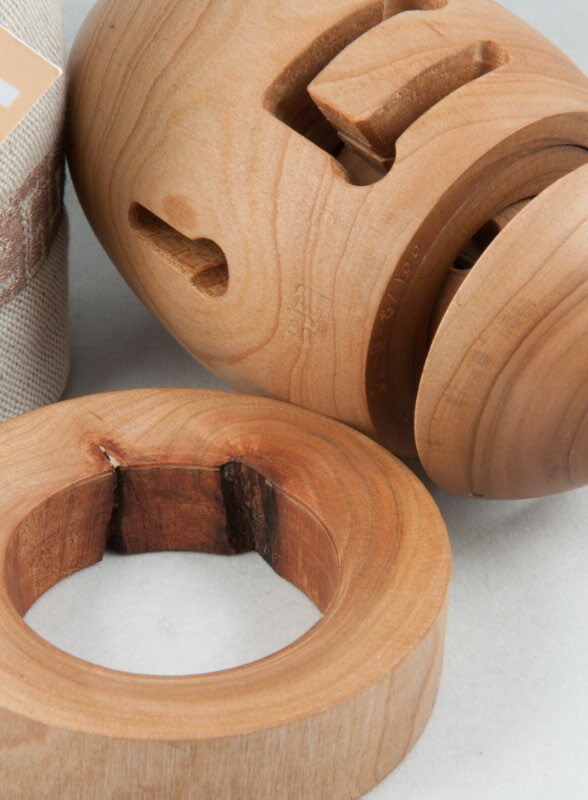 But almost more than all that, this is an object of serious beauty – the wood is beautifully selected and turned to show off the unique characteristics of this bit of wood (look at the stand if you’re not sure why I’m saying that) – made by a serious craftsman, with a lot of pride. 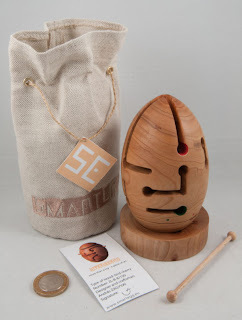 Thanks for arranging this SMARTEGG for me, Bernhard – it’s gorgeous! DISCLAIMER: Sorry, this post may be a little more indulgent than the others have been – if you can believe that! Okay, so the hundredth post went up at the start of November – which I reckon makes it about 12 posts a month, or a post every couple of days or so (I’m not great with numbers!) – not a bad average, although I’m rather aware that over the last couple of weeks I’ve been letting that average slip quite a bit. (Sorry. Bit of lurgy.) But that just says I’ve written a lot, and we’ve already agreed that was just me being selfish ... but the thing that has astounded me has been the reaction to the blog – there are actually people out there who seem to like it, and read it. Regularly even! As of this afternoon it had 21,700 page views, which given that I haven’t actually done anything to try and drum up any support, kind of astounds me. Heck there’s even a bunch of people signed up to follow it – admittedly I know a few of them – I’m guessing that the family kind of feels obliged to, and I can kind of understand some of the MPP guys wanting to keep up to date on MPP-stuff, but there are a bunch of names in there that I recognise from the wider puzzle-world that I’ve never met. Real puzzlers. 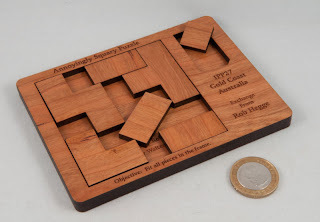 Puzzlers who actually design things, not just play with them like me. And that’s all rather humbling actually. A couple of weeks ago at the DCD I was more than a bit taken aback when I met folks for the first time (you know, real puzzle folks!) and they referred to my blog – that sort of blew me away a bit and made me wonder if I needed to take this whole thing a bit more seriously, after all I’m still just doing this because I enjoy it ... the fact that some others choose to read it as well is simply a bonus. What has been quite interesting is watching the stats on the blog, and in particular what posts are more popular than others. There’s one page that got way more hits than any other. The Shapeways Shopping page, but that was pretty much all driven from somebody tagging it on Stumbleupon – presumably somebody connected to Shapeways (don’t call me cynical!). Anyway, what I find interesting is the pattern in the stats after that – all the posts that get a lot of traffic are the ones that are really about people – the one about the visit to Wil’s place was undoubtedly boosted by Wil’s mentioning it in his round robin email, but the series of posts about our MPP meetings consistently come out high in the page stats – and that, I think , confirms my old suspicion about puzzlers – they’re a good bunch and they like to hear about other puzzlers having fun with puzzles – possibly even more than just hearing about the puzzles themselves. Those are also the posts with the longest list of comments on them ... and speaking of comments – over 150 of them have been added to the blog – and that’s great – it’s kinda nice hearing people’s thoughts or having them share their stories and experiences in here as well. So thanks to those of you who’ve taken the trouble to do that. One other thing I hadn’t realised was quite how much non-standard English has crept into my language in general, and my casual writing in particular. Quite a few times I’ve found myself having to explain a phrase or two in an email to someone who’s just been totally confused by my turn of phrase. [I blame my South African upbringing and spending 5 years in Glasgow before moving down to England.] Given quite how much I’ve managed to confuse some folks in the States with my version of English, I have no idea how my French and Russian readers (yeah!) are managing to put up with my writing. OK, so where are we: I’m amazed at the reaction my selfish little project has had, but hey, I’m still doing it because I enjoy it, so I intend to carry on in the same vein. You can expect to hear about the puzzles that I enjoy (and only about the ones that I enjoy, because this is my selfish little blog!) and any get-togethers that I manage to arrange or get along to – I like writing about those because they help me to re-live them and keep them fresh in my own mind – the fact that you folks seem to like reading about them as well is just the icing on the cake. 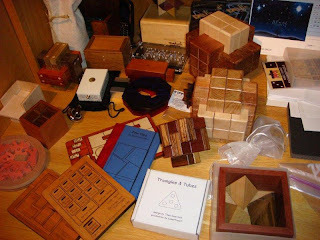 OK, there are plenty of puzzles on the desk to be played with and several will no doubt make it into a post coming your way soon – thanks for reading my blog and indulging me in a bit of navel-gazing – I enjoyed that ... normal programming will resume shortly! Next morning back at the Micro Centre, after checking out of the hotel and tossing our bags in Louis’ car, things looked rather different. 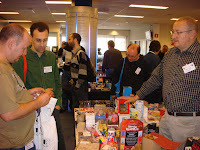 The night before there were two or three tables full of puzzles (mainly courtesy of messrs Strijbos and Schweitzer) – now there must have been twenty different folks displaying their wares and the remaining tables were filling up fast. Where there were ten or twenty folks milling around the night before there were now eighty or a hundred – and we thought we’d got there early! Marcel then gave us a tour through his table down the other end of the hall and despite me being rubbish at packing puzzles I came away with a copy of his exchange puzzle from Berlin this year- even though he was happily telling us that nobody had solved it yet! I don’t hold out much hope, but it does look very interesting and looks fun to fiddle with! While wandering around aimlessly I spotted a name tag I recognised from an auction I’d recently bid on – a pair of silhouette puzzles from the IPP in Berlin. While we were discussing payment and shipping after the auction, we became aware that we’d both be in Eindhoven for DCD so agreed to meet there and exchange puzzles for cash – cool! So I got to meet the German puzzler behind the Geduldspiele site and pick up a pair of unusual silhouette puzzles. He was hoping to have a whole bunch of his puzzles cut for DCD but had a bit of a problem that burned out his laser cutter the week before DCD and the replacement parts had arrived too late to produce many puzzles. Back in the general vicinity of Bernhard’s table I noticed two gents talking animatedly over a little wooden box - admittedly not that unusual at this sort of gathering, but I recognised the inlay work on the box from a photo posted on Renegades a little while back. 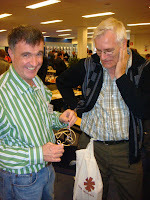 A quick check on the name badge confirmed this was Jack Krijnen showing off his own version of a travel burr set – so I introduced myself and met another Renegade. Jack’s burr set really is something else – it’s a 42-piece set of notchable marble wood pieces in their own beautiful wooden box, complete with inlaid detailing on the lid – apparently Jack’s first attempt at inlay work – if he tries any harder he’s at serious risk of becoming rather jolly good at this! 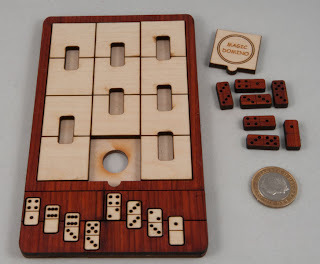 :-) The thought that’s clearly gone into this set is great – right down to the compartment for the cards carrying the various combinations of pieces to build burrs from – gorgeous. Soon after meeting Jack, another Renegade, the legendary burr-bloke, Ronald Kint Bruynseels wandered past so I said hello to him and heard about some of the interesting new ideas that he’s currently working on – and if he manages to work out a couple of the remaining challenges with his current ideas he’s going to unleash some very interesting new designs on a grateful puzzling public. Back at Wil’s table he introduced me to Rob Hegge, who in turn introduced himself with a smile as “Hi, I’m Rob, I don’t have a blog,” – a couple of folks mentioned the blog during the course of the day and it still surprises me a bit that real puzzle people actually seem to read it. A little while later I relieved Rob of a couple of his recent exchange puzzles: two packing puzzles (yes, because I’m rubbish at them!) and a little board burr. The two packing puzzles came on the cruise with me and have given me quite a lot of fun and more than a little frustration, but both have now been tamed and I have photographic evidence to prove it (and to remind me what the solution looked like!). 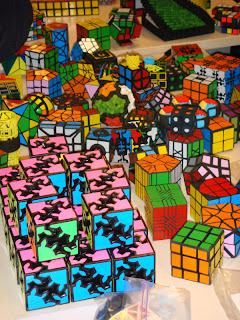 During the course of the morning, Geert Hellings announced that Georges Helms had decided to downsize his puzzle collection and had donated a number of prizes for the Speed-cubing competition and had also donated a couple of tables-full of twisty puzzles for anyone to help themselves to. There must have been quite a bunch of them because despite the considerable attention those tables received, there were still stacks of twisties left later on in the day when I had a rake through them – by that stage there were mostly 3*3*3 cubes left, but they were all different, from branded puzzles advertising mobile phone networks to Disney characters – one of which is now headed for Nigel’s girls to play with. Thanks Georges – nice one! The NKC laid on a great lunch for everyone, ensuring that there were plenty of complimentary drinks and snacks on the go throughout the day – all included in the EUR 10 entry fee for adults. Mieke and the kids joined us for a few hours in the afternoon and it was great to see the kids faces when they spotted puzzles they recognised and even nicer to see how the stall-holders went out of their way to spend time chatting to the kids and show them new puzzles ... each of the kids came away with a new puzzle (only fair since Louis had picked up a couple for himself already!) 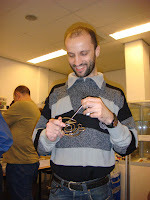 and had great fun sitting at a table playing with them during the course of the afternoon. 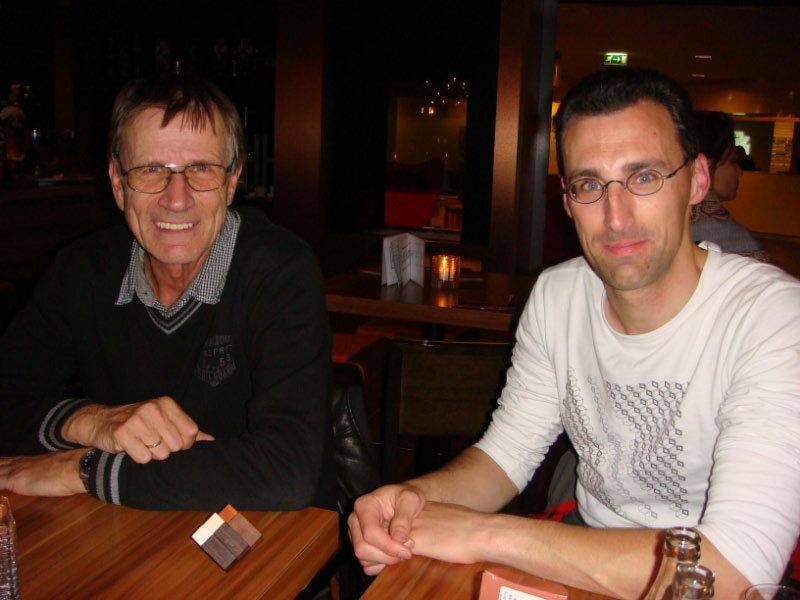 While we were sitting at the table I noticed someone playing with one or two things on Wil’s table and felt the need to go over and thank this gentleman for literally saving me months of my life –and that’s how I met Andreas Roever, author of Burr Tools. After getting over my slightly unusual means of introducing myself, Andreas chatted about his plans for renewing the user interface as a pre-requisite for introducing some new functionality and generally tidying things up a bit. I asked him if he was sick and tired of people asking him when Burr Tools will be able to handle rotations, thinking he’d be sick and tired of the standard question, instead he was happy to talk about how he already had a plan for how it could be done and had some ideas for implementing it, but that it would require a total overhaul of the guts of Burr Tools which is currently based on pieces never being able to rotate – what a nice bloke – and he really has saved me months of my life! During the course of the afternoon I did a little more shopping at the Strijbos shop, picking up a copy of his exchange puzzle from Berlin, some Doughnuts, the other aluminium dovetail and a floppy cube to replace one that broke a little while ago. The Krasnoukov family had set up shop next to Wil’s table and seemed to be doing a brisk trade all day. 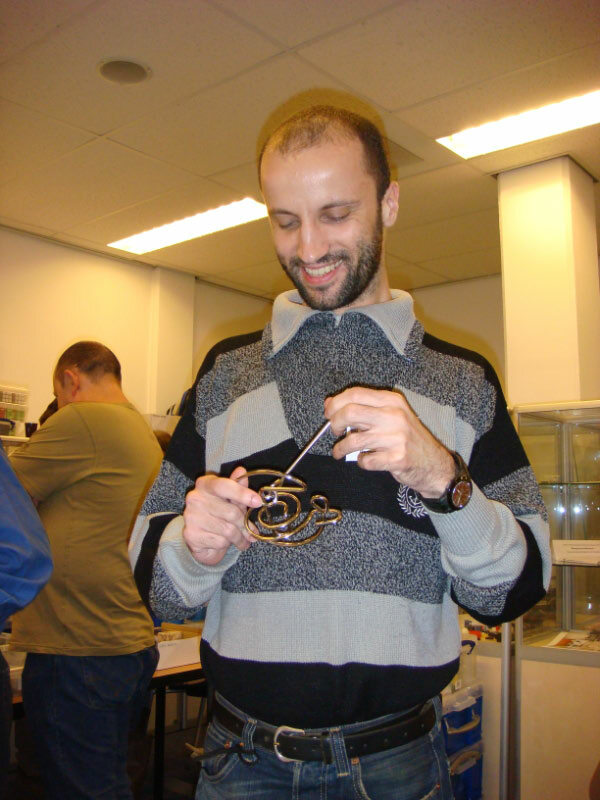 Their exploding / trisected cubes seemed pretty popular and Vladimir seemed to take great delight in demonstrating his Paradox exchange puzzle that appears to bend space and matter ever so slightly between two apparently equal halves of a square. 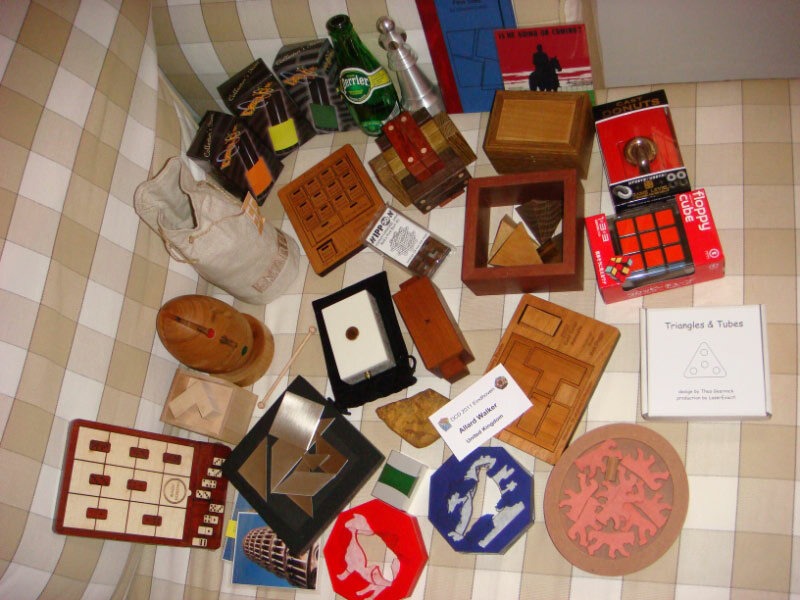 They also had a selection of Vladimir’s excellent packing puzzles available next to a set of hand-carved wooden replica tools (pliers, side-cutters and the like!) - beautiful work. We spent the last hour or so upstairs watching the first part of the Speed-cubing finals – wow these folks are incredible! We’d seen snatches of the blindfold competition earlier on and that was pretty mind-blowing – how anyone can memorise a cube and picture the interactions of the moves on the starting position in order to work out how to solve the cube is quite simply beyond me. It was quite interesting to see the different strategies coming out, from “slow and steady to get a time on the board” through to “if this works I’ll be untouchable”. Quite a few times there’d be a finishing flurry, followed by a downed cube and hands on the timer pad, only to be greeted by a groan when the blindfold went up to be greeted by the sight of a couple of misplaced cubies – invariably followed by the briefest of post mortem to confirm where things must have gone awry – even that was blowing my little mind! There was a brief interlude between the humans battling for supremacy with the first international Lego robot speed-cubing competition – held between a robot from France and one from Germany. These robots are pretty interesting being manufactured from standard components and using only Lego hardware, so the solving routine needs to fit in the Mindstorm’s available100k or so of memory. A few fraught minutes of tense competition saw the German machine toss its cube into the air a couple of times, getting it replaced by its handler most times, before the French robot stormed to victory netting Jean-Claude Mathieu a bottle of wine and the adulation of the assembled masses. The finals of the 3*3*3 cube solving competition was a pretty frenetic affair and we got about halfway through the finals when we had to leave to catch our plane back to Blighty. Up until then there’d been quite a few sub 10 second solves, all greeted with applause - but Sod’s Law dictates that about 10 minutes after we left for the airport, the European record was toppled! That Irish budget airline that shall not be named since the time they left Gill and I in a tent in Beauvais after cancelling their last flight out, got Nigel and I back to Stansted without any fuss and he took care of the drive back to Birmingham – thanks mate. That was one heck of a weekend. I got to meet and spend time with some of the legends I’d only ever read about or swapped emails with. I got to play with some very rare puzzles and managed to add a couple of tremendous puzzles to my little collection – what a great weekend. – this time in the other direction! 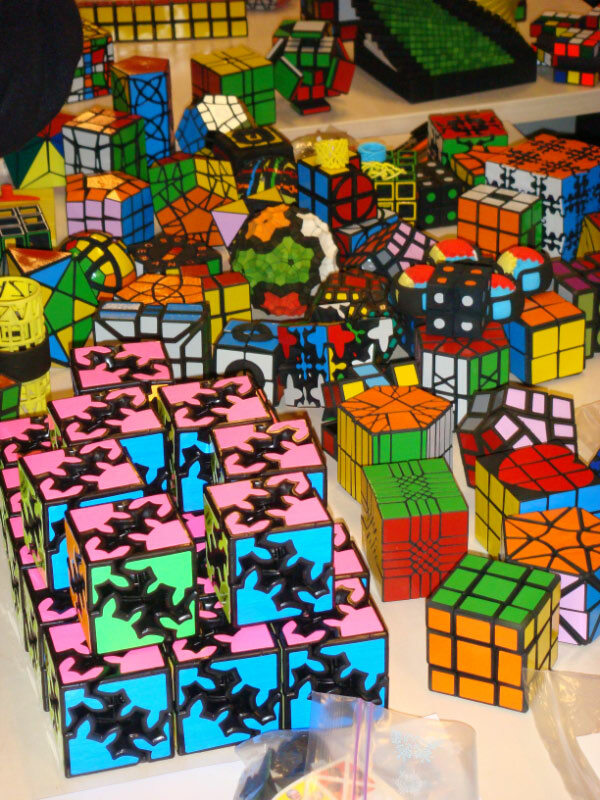 The annual Dutch Cube Day has pretty much become a weekend affair, with the Dutch National Speed-cubing Championships being run over two days, and the Puzzle day taking place on the second day. 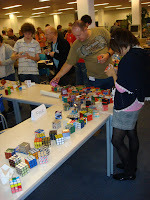 This year the event was held in Eindhoven and judging by the turnout, it seems to be pretty popular with puzzlers in general, and cubers in particular. Nigel flew into Eindhoven on Saturday morning and Louis picked him up from the airport and brought him into town. The three of us then spent a couple of hours wandering around the centre of Eindhoven seeing the sights before we headed for a (normal!) coffee shop for a long chat about puzzles in general and one or two that had stumped us at Wil’s place the night before – that Foshe lock came in for quite a bit more discussion, but very little new insight. From there we wandered off to a toy store to pick up a few Dael-o-rings for ourselves and some puzzling buddies back in the UK before visiting the only gaming / puzzle shop around to acquire a couple of knick-knacks before the serious puzzle purchasing began later on. Lunch was at Louis’ place with Mieke and the kids, who despite being only 4 and 6 respectively, were both keen to demonstrate their puzzling skills with a ball-shaped diagonal burr and a tangram set – it’s great to see the next-generation of puzzler already being thoroughly indoctrinated! Later that afternoon we wandered back into town to have a look in on the first stages of the speed-cubing competition and to see if any of the purveyors of fine puzzles had set up their stalls yet. We’d been assured that Wil would be there and had a pretty good idea that Bernhard Schweitzer of Puzzlewood fame would be there too. We peered in on the speed-cubers upstairs for just long enough to appear interested and then went back downstairs to find Wil and Bernhard in full flow setting up their stalls for the next day. Wil had already covered four or five tables in a series of plastic crates, some of them two or three crates deep. Nigel and Wil were introduced and I left Nigel trawling through Wil’s crates while I went off to introduce myself to Bernhard. When I wandered up to his table he was demonstrating one of his Smarteggs to a rather interested puzzler who then promptly went and vanished when I introduced myself with “Hi, I’m Allard and I’m hoping that one of those is for me” – I’d asked Bernhard to reserve one for me after he announced on Renegades that he’d secured a couple for sale at a rather reasonable price – but I’ll tell you more about all that once I’ve had a chance to play with the Smartegg itself. Bernhard had a great selection of items from his gallery, including a number of little things that hadn’t been for sale for a while ... then he also had a couple of plastic crates of one-offs, remainders from IPPs gone by – and seeing as how it was the day before the puzzle day, as it were, there weren’t many other folk clamouring to get their paws on stuff, so I had a leisurely trawl through the boxes and found a couple of little gems, including a Sandfield Spider’s Secret from a while back, a competition-entry sized Tornado and a Pelikan reproduction of Trevor Woods’ Trev’s Diabolical Fives. The craftsmanship on the latter is really staggering and it’s easy to believe Bernhard when he says that they’re the only ones who’ve been allowed to make these reproductions. Things started winding down for the day at the Micro Centre and we made plans to meet Wil and Bernhard for some dinner a bit later. Nigel headed off to his room to catch some sleep, having had such an early start that morning that he hadn’t got any sleep at all the night before! Louis and I took our newly acquired puzzles to my room and wiled away a couple of hours puzzling with our new toys. That session saw Wil’s Evian bottle solved while Louis took photographs as evidence – Wil’s sense of humour comes through in a major way on that puzzle! I popped the rod into my shirt pocket as evidence that I’d solved it for Wil. We met up in the hotel lobby and wandered back down the road to find a bite to eat. We were hoping to try a Greek restaurant that Bernhard had recommended, only to find that quite a large number of locals had had the same idea and there was a long queue outside, so we switched allegiances and tried the Italian a block away. Bernhard seems to know his food rather well and felt the need to test their Carpaccio before committing to anything else – sadly the Carpaccio didn’t pass muster (in fairness mine was a bit watery and not especially tasty) so he entertained us while we made our way through our main courses – the pizza was good though! Plenty of chat about puzzles, IPPs past and present and plenty of stories about puzzling personalities. Bernhard and Wil were on top form and had us royally entertained. After dinner we headed back to the hotel bar for some drinks and some puzzles, and even more puzzling stories. Nigel brought out the Foshe Ring Box he’d acquired from Wil that afternoon and several of us had an unsuccessful go at trying to get into it. We called it a night at a fairly reasonable hour – indicative of the fact that most of us had travelled across to Eindhoven at unsociable hours over the previous day or two. Words and Pictures (c) allard. Awesome Inc. theme. Powered by Blogger.